Of course I’ve had roommates before. Down on Earth™, I mean. Not up here in the Thermosphere™. But the new policy makes double-occupancy mandatory. It’ll be good to have someone to talk to and interact with. Maybe even touch like once a year or something. It’s ridiculous and kinda pathetic. 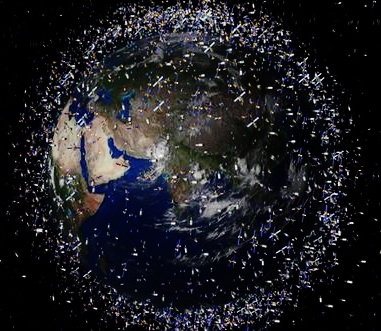 1.2 trillion of us crammed into such a small space, yet we all live completely disconnected lives. All realms of our Inhabisphere™ are overcapacity. Down on Earth™, the thousand-story skyscrapers are packed so tightly over every acre that they’re pretty much a single, sprawling building. The Tunnelands™ have already burrowed farther than they safely can. Even the Sealands™ are filled now: the ghettos on the seafloor and down in the trenches, the upscale topside floaters. In the Skylands™, only two narrow causeways remain undeveloped. The Housing Council™ started the Thermosphere Development Program© out of desperation. They launched the Duplex Orbs™, like the one I live in, through the northern port of the Skylands™ a year ago. That’s when a billion of us moved up here to orbit like secluded satellite moons. The Resource Restrictions Act© forbids us from visiting one another. So we basically live in floating prison cells. The last two ports through the Skylands™ close tomorrow. They’ll be sealed shut to gain the last bit of atmospheric real estate remaining. After that, we won’t be able to directly trade with the Groundlands™ anymore. Tariffs are gonna skyrocket. My last shipment from the surface will be here any minute. This month’s visit is a bit different than all the rest. Twice as much Oxygen®, twice as many rations. All because my Duplex™ is about to house twice as many people. Dania seemed cool enough during our minute-long v-Chat®. Kinda quiet and distracted maybe, but I’m hoping she’ll open up once she gets here. She’s a Digi-Designer® like me, so we at least have that in common. If she’ll unplug long enough to give me three minutes of face time a day, I’ll be happy. Five minutes would be even better, but I’m trying to be realistic. The supply taxi just docked. The recycled Oxygen™ is already pumping into the tanks. Why am I so nervous? There goes the bay door. The rations are loaded. Oh Gods™, the airlock. I think I’m gonna throw up. The first flesh-and-blood person I’ve seen in over a year. The stranger I’ll spend the rest of my life with. The warning horn blares. The door swooshes open. Dania stares at the PodPad® in her hands. Her left eye twitches a little. That might be a sign that she heard me. “Your room’s on the right,” I answer. Without looking up, she expertly navigates the furniture in the common area. She places her palm on the KeyPad® and steps inside her room. Her PodPad® monopolizes her attention. “What kind then?” she asks. Then her door swooshes closed between us. That was six months ago. I haven’t seen Dania since. I’ve stumbled across her username in the forums, so I know she’s still alive. Sometimes, I press my ear to her door, but I’ve never heard a thing. It’s sad, really. We’re now up to 1.4 trillion people in the Inhabisphere™, and I haven’t seen one in half a year. Haven’t touched one in almost two. There’s no way I’m the only one who’s lonely. There must be others tucked away somewhere in our stuffed-full world. I keep hoping Dania will accidentally come out of her room, that she’ll forget she has a roommate in the Duplex Orb™ and will stumble into the common area by mistake. Or that she’ll suddenly get the urge to unplug and interact. Just sixty seconds, once a month. That’s all I need. There’s a new plan to add more Duplex Orbs™, to link them airlock-to-airlock so they form a massive sphere encircling Earth™. Maybe my new neighbors will want to hang out. But I’m not holding my recycled-air Breath™. This entry was posted in Flash Fiction, Short Stories, Writing and tagged flash fiction, Futuristic, Humanity, Resources, Sci-Fi. Bookmark the permalink. I love the trademarked terms. A good idea, thoughtfully executed. That detail actually came about during a “final” read-through. Seemed pretty fitting for the world.